At D & H Plant, we offer a large range of plant machinery, offering Yanmar mini & midi excavators from 3/4 ton up to 5.7 tons machines including micro diggers, zero tailswing diggers and long reach diggers. We hire a selection of Thwaites, Benford & Barford dumpers with a variety of straight tip, swivel tip and high lift tipping, as well as Yanmar tracked dumpers, sizes vary from 1 ton to 7 tons. We also offer a selection of Libra, Gehl and Bobcat skidsteers available with a variety of attachments. Our tool hire department carries a wide selection of equipment, including plate compactors, belle mixers, floor sanders, drills, breakers and water pumps. 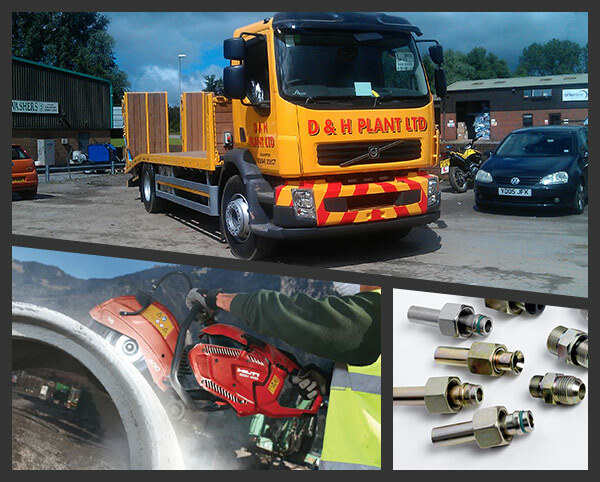 We stock a huge range of hydraulic hoses, fittings and adaptors, which we manufacture to meet our customers needs, whilst you wait. We are a family business and welcome both trade & DIY customers. Feel free to browse our site and do not hesitate to contact us with any questions, queries or bookings. If you are looking to hire a skidsteer, please give us a call on 01884 32627 as they are getting busy. Gotta love a Bank Holiday - our lorries are flying in and out trying to keep up!